Hello Friends, today’s post is a mixture of looking back and looking forward! You will see what I mean. 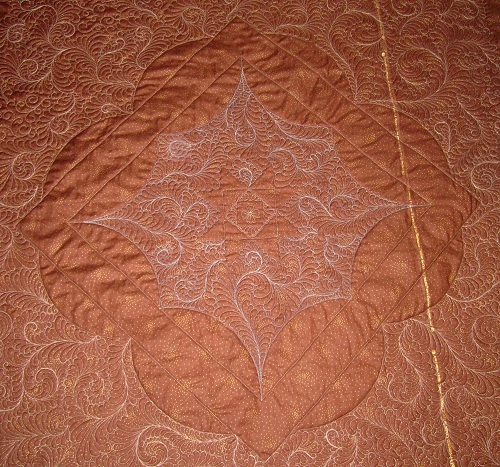 I quilted with 100wt silk thread when I first started machine quilting on my domestic machine back in 2006. 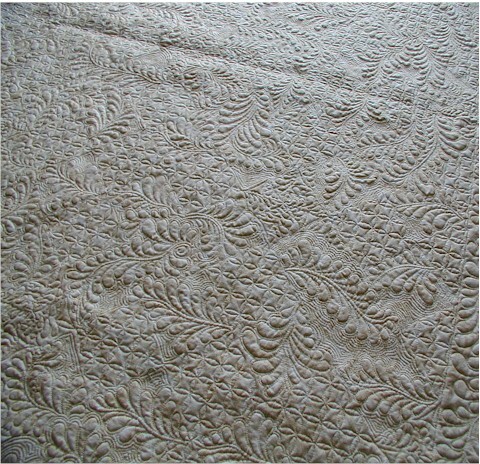 Undoubtedly the effect of quilting with 100wt silk thread on fine fabrics is spectacular! 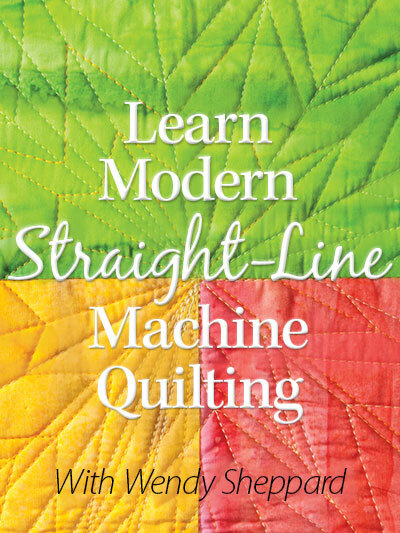 Very soon after that, I heard about the Aurifil Mako 50 cotton threads being used for machine quilting. I would still quilt with the 100 wt silk threads if the opportunity arises, but I feel like Aurifil Mako 50 cotton threads allow me to quilt fancy as well as practical — I can still have amazing quitling results, and have the Aurifil Mako 50 cotton threads hold up the quilt sandwiches well enough for practical uses. 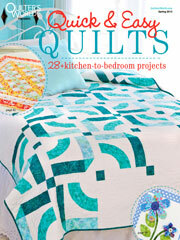 I personally wouldn’t use a quilt made with silk dupioni that is quilted with silk. To me, a silk on silk quilt is something the beholder “admires with his eyes and not his hands” — something I tell Miss Baby whenever we are around breakables at the stores! 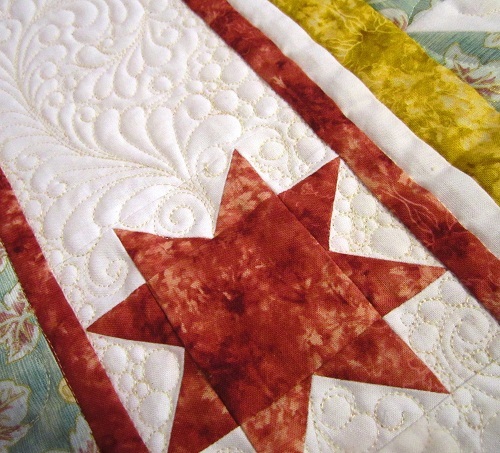 :) The following shows a few quilts (out of many) with which I have quilted Aurifil Mako 50 Cotton. I highly recommend Aurifil’s Mako 50 weight cotton for beginners and advanced machine quilters alike, and especially beginners because the fine weight is very forgiving. It’s as if the threads “melt” into the fabrics! 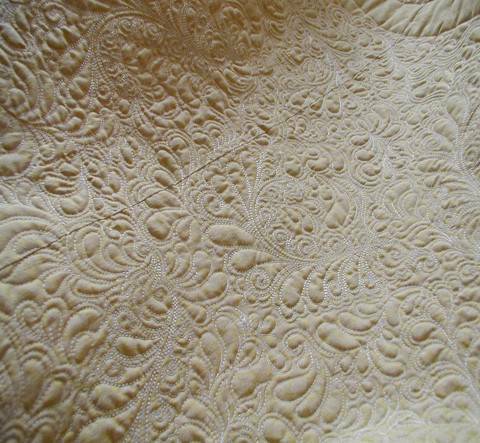 So ALL these years I have only quilted with Mako 50 weight cotton threads, because they work beautifully! I am also the type that always orders the SAME dish at the SAME restaurant almost every time (well, every single time) once I find a dish I like! I get that from my Dad…. 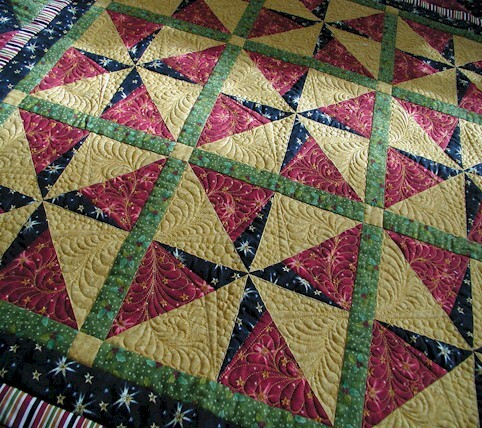 So, I have just been quilting with the 50 wt, and haven’t tried out the other weights. This past week, I was asked to experiment quilting with Aurifil’s Mako 40 wt (slightly heavier than the 50wt), and then their Mako 28 wt (a little heavier than the 40 wt). So, I broke out the Aurifil sample thread pack that many of you probably also have to get out the 40wt and 28wt spools. Here is how my experiment turned out…. (green = 40wt, and silver gray = 28wt). I mainly wanted to see how tiny I can quilt with the 40wt and 28wt threads… You can see from the penny that is used as a reference, I can quilt pretty tiny with both the 40wt and 28wt threads. I think the tiny pebbles are a little “cleaner” quilted with the 40wt compared to the 28wt. However, considering how tiny my pebbles are compared to that penny, I think the effect is really not bad with the 28wt. Here is the back with the 50wt being used as bobbin thread. 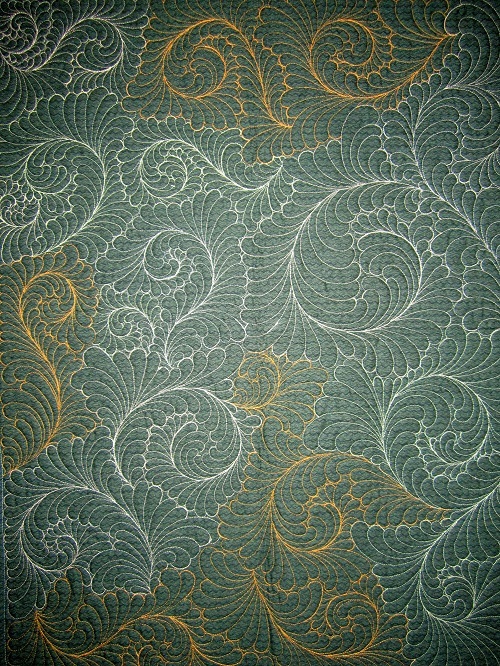 Compared to the front picture, you can see that the effect of quilting with 50wt being finer and more subtle in the picture below. Here in this picture, you can see how the 28wt silver gray stitches show up more prominently than the 40 wt green stitches. SO…. what have I concluded? 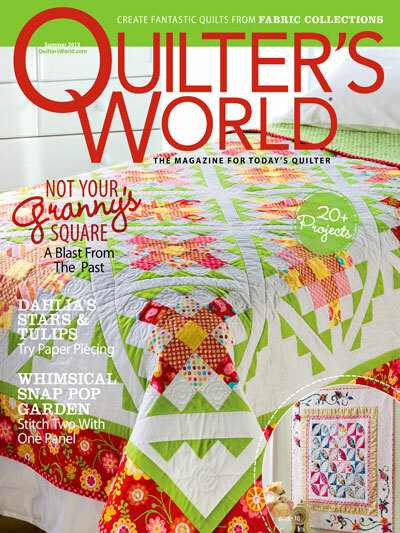 28wt definitely showcases the quilting more prominently. But as a personal choice, I probably wouldn’t use it for areas where I will have to stitch over previously stitched stitches too many times where the thread buildup will be noticeable. With the 50wt, oftentimes, I would quilt the same path at least 5-6 times before I would start to see a thread buildup. 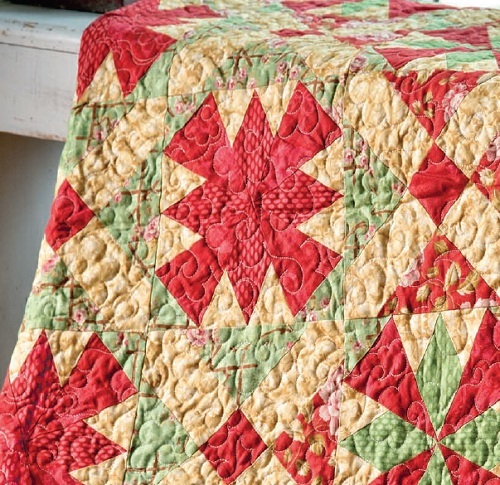 I love that the 40wt shows the quilting a little better, and it will probably be my choice to quilt wholecloth quilts, especially when I want a strong contrast. 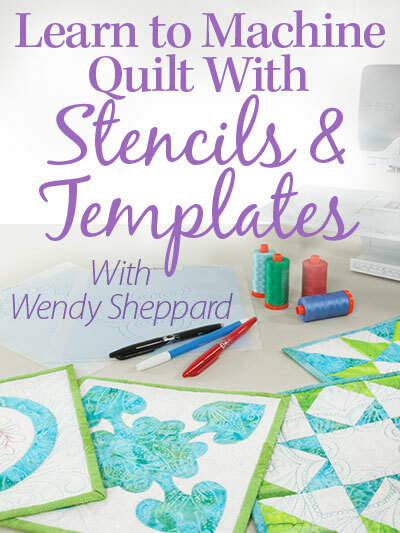 I will, of course, keep loving to quilt with 50wt, and am now thinking about expanding the uses of the 50 wt (beyond the appliacations for which I already use) for tone-on-tone micro-fillers in a wholecloth settings, and for accents here and there. You already know I am not a fabric hoarder! BUT I have to confess I am somewhat a thread hoarder. I love threads more than I do fabrics. AND…. discovering the 40wt and 28wt is not helping me with the thread hoarding issue. HELP! 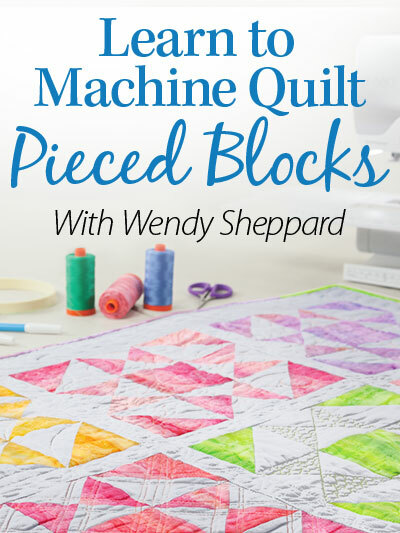 Now, if you are a beginner — I encourage you to still quilt with the 50wt, until you are more comfortable in moving your quilt sandwich before you try the 40 wt and 28wt. 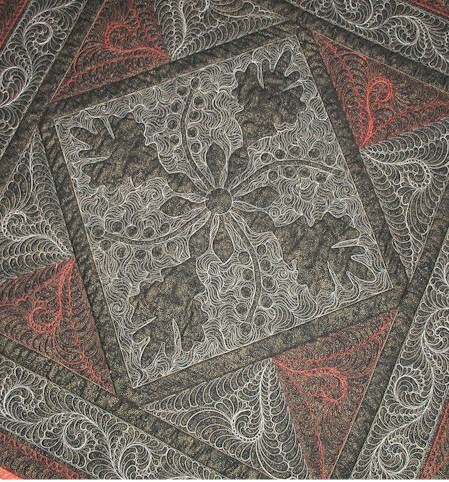 I think when you are still familiarizing yourself with domestic machine quilting, you will be happier with the very forgiving effects of quilting with the 50 wt. Thank you for stopping by, Dear Friends. Happy Monday and Happy Week to you! …. 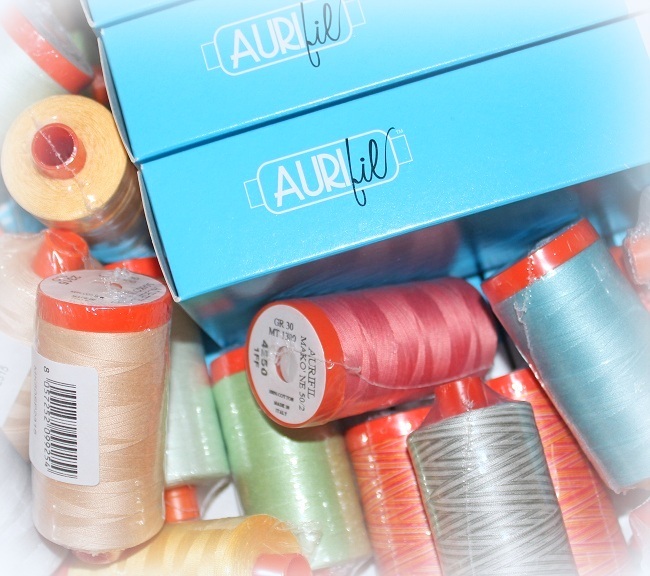 getting my Aurifil thread spools in the mail! Receiving threads in the mail is one of the highlights for me!!! Those spools of colors are like candies – only without calories! :) I debut my Thread Talk series with a post on threads. 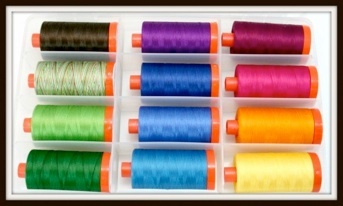 Click here to read about my thoughts on Aurifil threads. Thanks for stopping by, Friends! I hope you have a lovely rest of your week. 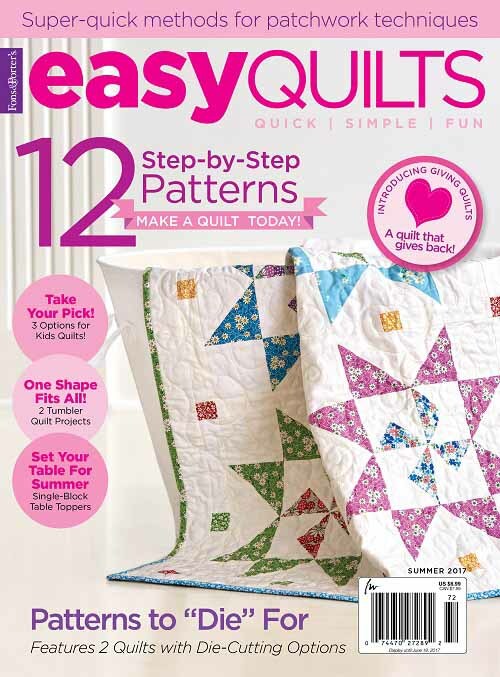 You know I love love love to piece, sew, and quilt with Aurifil threads! 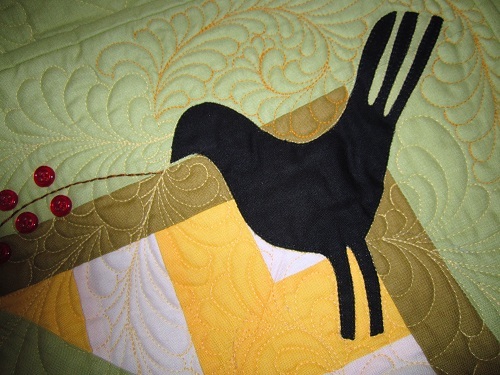 The following are pictures of quilts I have quilted with Aurifil Mako 50 Cotton threads. The people at the super awesome Aurifil thread company that makes my favorite threads have graciously offered a large 12-spool Aurifil thread kit as a prize to celebrate Ivory Spring’s 1,000,000 milestone. These colors are just perfect to nudge in spring, don’t you think? Click here to follow Aurifil’s very happening Facebook page. Thank you again for stopping, and with that, I wish a very Happy Monday, and Happy Week!